Hey Triggerhappy. Been enjoying Dark Lineage Owen ORPG a lot, great work on it! :) Was just wondering if there was a way to help or speed up development? I'd be more than willing to put some time into testing etc. It's such a fantastic map. Right now I'm busy trying to release my own RPG ( https://discord.gg/qr3dBgd ) I haven't worked on DLO in a while but maybe I'll pick up development to fix some bugs and remove the hostbot-specific features I implemented. Hey TriggerHappy. Appreciate the work you do! Would it be possible to tweak or remove that "illegal action" system in Dark Lineage RPG? It's almost impossible for me to level up in some areas as it just gives me that message and resets my level and after it happens 3 times my bag disappears. Makes it really hard to progress as it happens very often on my new character and mostly always in the fire area. EDIT: Seems this only happens in v0.19 for me. Tried loading up v0.14 and i never got the message. Happens when you level to fast to prevent loading offline and using cheats. Hey so I've only ever encountered this in Dark Lineage Owen that you've been keeping updated. Randomly throughout the game I will encounter the ability to not being able to click on the screen anymore. Has anyone or you ever had this problem? Out of the 7-8 custom maps I regularly play DLO seems to be the only one I've had this problem. So the command "-debug stop" fixes the problem. The replays I have are long afk grinding games, but after posting on Reddit and Discord people seem to think the problem is from moving through menu to fast. My guess is from adding attributes or moving stuff in and out of virtual inventory to fast. Was wondering if I could please get your help with your codeless save/load system. Essentially, I need a simplified variation of it that would work with a NON rpg map. - Spawns unit at designated location. - Limit when it can be saved and loaded & by team maybe?. Start of match one team loads their units and they are then released and lose loading, then the next team does same. After a team wins, it resets the map so that they can have another round and players repeat the char selection and loading part before release. May save any time after they have a character though. - Expandable slots so that each type of character and new ones added can be saved and loaded by each player. Adding a slot per new character? This is the basic idea. Just checking in advance if you would even be willing. I don't have time to do this, sorry. Someone with basic triggering experience should be able to do this for you. If it's not difficult for you, can you contact me? Take a look at the "Start Game" trigger to see how to give any unit their own custom inventory. Just want to say, I do it not as a public project, but just for myself and my friends, and I don’t really know much about the Jaas language. The project is on hold for a bit. I posted a meaningful thread for warcraft editing tools (https://www.hiveworkshop.com/threads/great-contributors-on-warcraft-editing-tools.312592/). 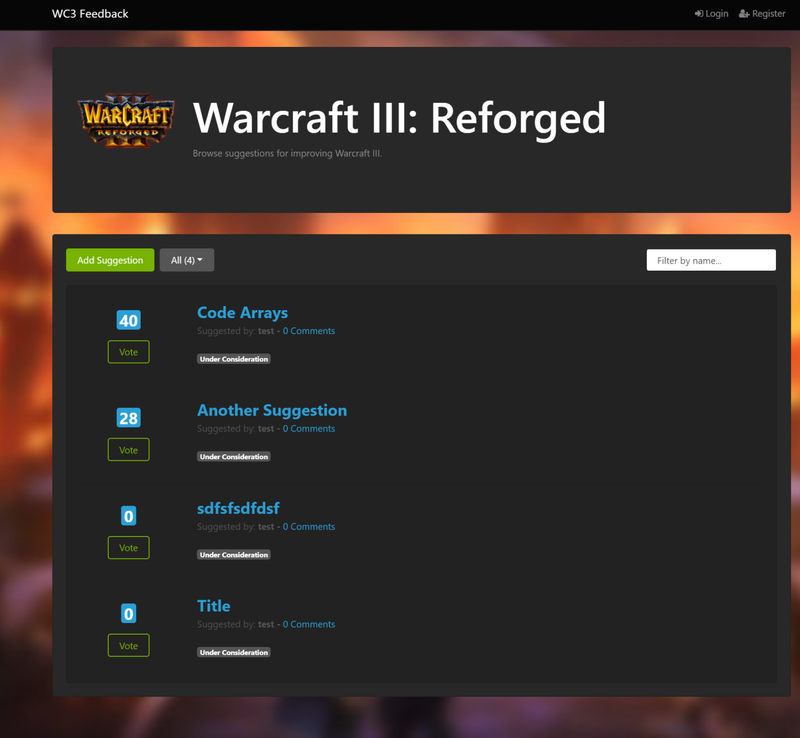 It summarizes all the important developers and their contributions on warcraft editing tools. I appreciate that you can adjust this thread into a sticky one. Thanks very much! Edit: I will maintain this thread regularly. Please, I beg you, manage the thread [Feedback] Request Features for JASS and the World Editor, and update the open requests. Many requests were posted, making this important thread nearly outdated. I feel using a single forum thread as an avenue for feedback is pretty inefficient. I've been working on a system for feedback which I think should work much better, but it's not finished yet. (Preview: https://i.imgur.com/dvOH888.png) It's taking a bit longer than I expected and it's also not the only thing I am busy with. I don't have the time or motivation to manage another feedback thread so in the meantime if you or some other moderator is up for it then that would be great. You created an awesome system. Continue on your great project! Edit: I am now not a moderator. Edit2: Could I send a request to blizzard directly via this feedback tool? Hey man, could you comment on my libraries when you have time? Both ArrayList and HashRecyler. Hey man just a idea for Dark Lineage Owen if you decide to do any updates. How about the ability to redo your attributes? I've considered it but not sure. It would encourage people to create save codes for every type of build once they get max level. I made a spell that prevent enemies from attacking when they are around. To make that I created a struct Data that check periodically the enemies around. For each enemy found I create a Struct Buff, that add the spell to prevent attack and check periodically if the target is not too far away from the caster and the duration too. The structs Buffs have the reference of the Struct Data. The question is : When my struct Data is destroyed, i still can access to the data inside from the Buff Structs. So How long is it possible? Why ? Is it a way to check if a Struct have been destroyed? does the struct is reused? So after the onDestroy method the struct is never removed. Hey guy i'm would like to restart this game, i'm looking for player to finish this new version. In DarkLineageOwen, i get cheat warning without doing aynthing im just farming and levling up then i get level reset, do u know the rules for cheat warning? 4. Would be great if some of the calculations were using the values of other parameters - for example, the size of the window surrounding the inventory slots would be based off the number of rows, columns, and icon width/height. 5. Also would be great if once the inventory fills up, the normal hero inventory started to pick up items instead. Do you know if the patch will still be extended? Hey man when you get a chance can you PM me about your site https://www.wc3maps.com/list.php got a few questions. thanks!